Want a cushion pillow with a statement? Look no further than the Banksy Heart Balloon Sofa Cushion! 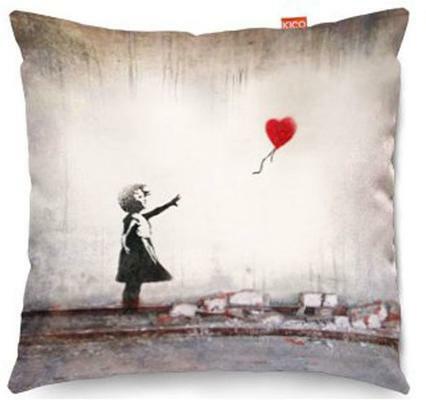 Featuring one of the murals of Banksy, this wonderful homage pillow showcases a little girl longing for her heart balloon as it flies away from the air. This wonderful graffiti piece has been translated into cushion form so you can display it inside your living room. Prop it up onto the couch to add some interest or maybe use it inside the bedroom. The image along with the quality craftsmanship of the pillow makes this a coveted piece. The pillow itself is hand made in the UK and crafted from fine faux suede. Each piece is machine washable too so you don't have to worry about popping them inside the laundry. Grab this for yourself or offer it up as a present. It comes in 2 sizes so you can choose which one you need.